Satellite solution that is catered for both Defence and Commercial Application — Solution that is scalable and offers ease of operations. Solution are offered with bandwidth consideration, site availability and any other special requirements. 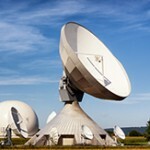 We are able to supply/install large scale dish, to providing fly away system for quick deployment requirements.